2015 is the year in which Misano takes over from Monza for hosting more rounds of WorldSBK. Currently, both of the Italian venues have 44 World Superbike races to their name. Only two circuits have more races starts to their names since the series inaugurated in 1988: Phillip Island and Assen, with 48 each. The first appearance of Misano was in 1991, the dominant year of Doug Polen, who did not miss an opportunity and registered what remains highest WorldSBK average race speed to have been recorded at the track: 157.726 km/h, although this was before the circuit was modified and changed direction in 2007. The 1991 success of Polen was not the only Misano double, however. In fact, the circuit has witnessed no less than 15 doubles from 22 race weekends, including the last four: Max Biaggi in 2010 and 2012, Carlos Checa in 2011 and Tom Sykes in 2014. There was no event in 2013, as WorldSBK raced at Imola and Monza instead. Another memorable Misano meeting was that of 1995. Now two decades ago, Mauro Lucchiari obtained the only two wins of his career. That weekend also saw Troy Corser pick up a third place finish which would mark the first of his 16 podium finishes at the circuit – no other rider has finished on the podium more times at a single circuit. Second in this particular ranking is Carl Fogarty, who managed to collect 15 top three finishes at Assen over the course of his career; this was beaten by Corser at Misano when he did the double on an Aprilia in 2000. In 1996, American John Kocinski took the establishment by storm as he clinched the double from pole position. He went on to win the world title the following season. 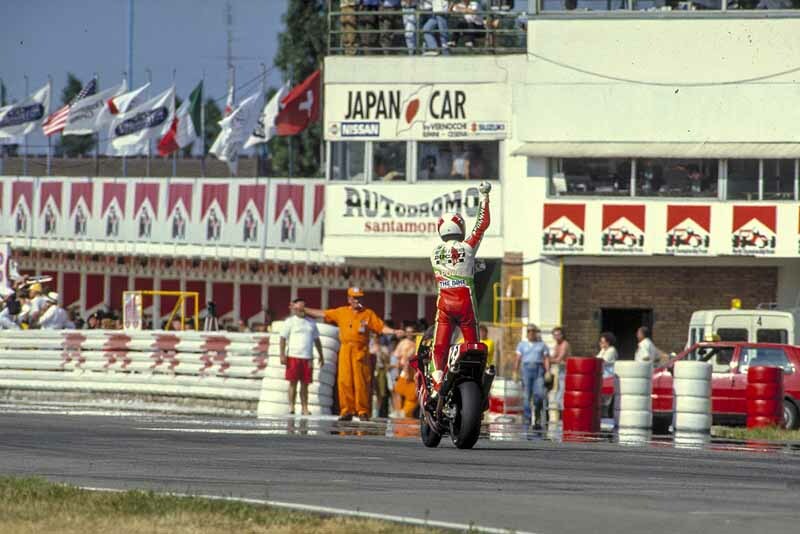 In 1999 – the year of ‘King’ Carl Fogarty’s fourth and final title – the Englishman scored his only two Misano victories. Perhaps more significantly from a records point of view, that June weekend also saw him clinch his 100th podium finish courtesy of the Race 1 win. Fogarty thus became the first rider to hit a century of podiums in World Superbike – a figure matched by Troy Corser and Noriyuki Haga in 2006 and 2009, respectively. As things stand, the records for most podium finishes are as follows: Corser leads on 130 from Haga (116) and Fogarty (109). The opening Misano race of 2001 featured success for World Champion-to-be Troy Bayliss after an intense fight with Ben Bostrom, who repaid the favour in Race 2. This was to be the first of six wins for Bayliss at Misano; this makes him the most successful rider for victories at the Adriatic venue, ahead of Max Biaggi on four. Misano was a truly special place for Pierfrancesco ‘Frankie’ Chili, Regis Laconi and Ruben Xaus; all three riders clinched their last career race wins at Misano. Chili did so in 2004 after staging a remarkable comeback in Race 2; he was 15th after two laps but edged in front of the pack on the final tour. Laconi did the double the following year while Xaus’ last win came in 2008, in Race 2. In Race 2 of 2009, an upcoming Jonathan Rea clinched his first World Superbike win. It did not come easily, as this was a year in which Ben Spies won no less than 14 times and the official Ducati team 11 times with the help of Noriyuki Haga and Michel Fabrizio. Rea started from Row 2 and was on the rear wheels of Haga and Fabrizio when Spies began to slow due to clutch problems. Rea may have had the Ducatis to deal with, but the Honda works rider sold a dummy on the last lap to move ahead into the first corner, then resisting the challenge for the remainder. Rea won, with Fabrizio just 63 thousandths of a second behind; Haga was also within half a second of the winner in the climax to a highly memorable race. In more recent times, Misano has tended to treat each year’s World Champion very kindly. Max Biaggi and Carlos Checa did the double through 2010 to 2012, while there was a crucial double for Tom Sykes last year; at the time, this consolidated the then reigning Champion’s lead in the title race. This cushion was held until the season finale in Qatar, where Sylvain Guintoli blasted through to win the title by six points.